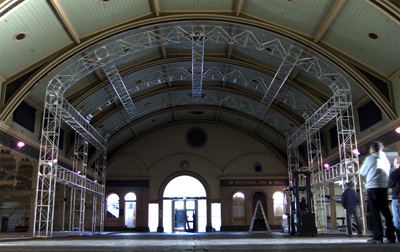 In March 2008, CLS provided a quote and design on a space-truss super-structure to install into the old North Melbourne Meat Market. It was approved earlier this year, and was installed June 2009 by Rob Irwin and his team at Element Rigging. The structure, built entirely from custom length & arc CLS 500mm box truss, perfectly follows the heritage-listed venue's timber roofline. It allows for acrobatic performances and the like to occur in the space - the venue's own engineer giving it a considerably higher rating than standard 500mm box due to the strength found in the arc shape. All of the arcs are interchangeable - not one component had to be registered or packed to make fit - a testament to the precision manufacturing processes at CLS. The structure was installed with custom base plates and packing for each foot - to ensure distributed weight loading on the uneven original cobblestone floor. 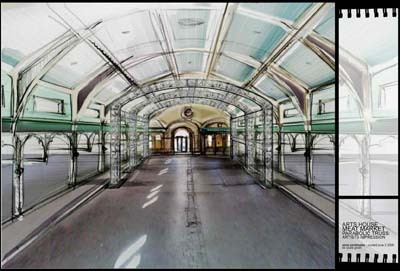 The result is simply stunning, and exceeded the expectations of the client. If you manage a venue that needs to broaden its horizons, you can count on CLS to provide a solution that is both sensitive to the venue design whilst also standing up to the dynamic loadings required for performances in modern venues."